The Amersham Museum is housed in a half-timbered merchant's hall dating from the 15th century. Within the hall are exhibits tracing the history and archaeology of the area, including medieval wall paintings, lacemaking, costumes, fossils, and local crafts. 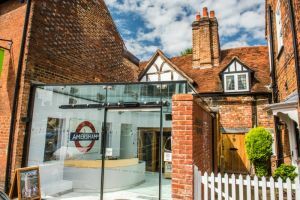 The museum is housed in the oldest building in Amersham, which once formed part of a 15th-century hall house. Behind the museum is a herb garden with plants traditionally used for medicine and cooking. In the garden is a restored Victorian privy as the museum building had no water supply until the 20th century! Within the garden is a modern memorial marking the 500th anniversary of the death of the first Amersham Martyr. The Amersham Martyrs were seven Dissenters burned at the stake for their religious beliefs during the reign of Henry VIII. The first execution took place in 1511 and the last in 1521. The museum's large collection of local photographs can be explored easily through a special touchscreen display, and you can order prints of the images for a small fee. Local companies are featured throughout the museum. There is a display of Goya Toiletries products, including scented soaps. Goya had their premises in the old Weller brewery buildings from 1946 - 1985. Two prized possessions in the museum collection are a pair of 18th-century longcase clocks made in Amersham by the Rogers firm. Perhaps the single greatest record of Amersham's past is the George Ward photography collection. This huge collection contains photos taken by Ward of Amersham and its surroundings over 5 decades from 1880-1930. Among the oldest objects on show are 14th-century floor tiles from the nearby village of Penn, and a wooden window frame from a Tudor hall house on the site of the current King's Arms pub. One medieval feature has not been brought to the museum from elsewhere; a series of witches marks are carved on the timber frame of the museum building. These marks date to the 15th century and were thought to prevent evil from entering the house via the hole used to let the smoke from the central hearth escape through the roof. A much more fun and friendly exhibit is a collection of Dinky toys once owned by Mr Butler's toy shop on Market Square. There is also a collection of local lace and lace-making tools, for Amersham was at the centre of a thriving cottage industry in lace during Victorian times. The area was best known for black lace, and there are several samples of Amersham black lace on display.